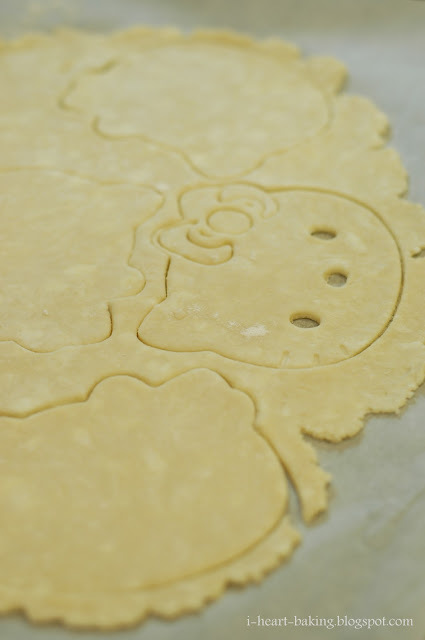 Using my largest Hello Kitty cookie cutter, I cut out pie crust for the tops and bottoms of the pies, then filled them with my apple pie filling (diced apples, flour, sugar, salt, cinnamon, and ground cloves). The eyes, nose and bow served as my steam vents (so that the crust wouldn't get soggy during baking). After crimping the edges with a fork, brushing with egg wash, and sprinkling some sandling sugar on top, I baked them at 400 F for 20 minutes. And out came Hello Kitty apple pie! I made a couple of these for my friend Hsing to give to her daughter Avery (she just turned 6! ), and I also made a couple for my friend Karyn in exchange for an adorable clippie (check out her handmade clippies at Zoette Boutique!). I also froze a couple so that I could bake them off whenever we want apple pie. You can now find my recipe for Hello Kitty Pocket Apple Pie and Pocket Pies in my new book, "The Hello Kitty Baking Book"! Enjoy! My girls would loved these Kittys...SO cute!!! omigoodness these are so darn cute!! they are too perfect to eat... btw, where did you get the HK cookie cutter? @sweetsbysillianah - i think i bought it at a sanrio store in hawaii ... i can't remember now because i've bought so many different hello kitty cutters! you could probably also find some on ebay? @ann - haha, yes it's hard to take the first bite into kitty, but after you taste it you won't be able to stop! So adorable!! I love them - I want to try one!! These look great. I did something similar not too long ago, but I used a pizza filling and no cookie cutter. What a smart idea! This was super cute and yummy, thank you =)! This is too cute. My little girl will be jumping up and down seeing these cutie pies (perfect name for these Hello Kitty pies)! She loves Hello Kitty. This WAY too cute! Such a good idea!!! i've been following your blog on and off for quite a while now, and i am just dying to know - where do you get your hello kitty baking supplies!? i am an avid hello kitty fan and other than pricey japanese import websites, i haven't really had much luck finding hello kitty cookie cutters, etc., but seeing goodies like this makes me wish i had some! what were the measurements for the apple pie filling? oh, and also what kind of apples did you use? WANT! These are too incredible for words. Next time I make apple pie, I will use these for sure! Thanks for sharing! Where did you get the Hello Kitty cookie cutter? Love these! @Jill - awesome!!! thanks for the feature! @Anonymous: for the crust, i use my favorite martha recipe: 2 1/2 cups flour, 1 tsp sugar, 1 tsp salt, 2 sticks butter, and ice water to bring it all together in the food processor. for the filling, i don't have exact measurements, but i used diced apples, flour, sugar, salt, cinnamon, and ground cloves. This is such a great idea!! I have this cutter and came by your site through the adorable HK macarons, but this is more doable for me. These are so cute! Gotta share it! @cindys Recipes and Writings - thank you! @Anonymous - sure, i got mine on ebay but it looks like you can also find it on amazon now!